Happy 2012, everyone. Trudi and I had a nice holiday break with the kids (including an amazing few days in Cabo), and with school starting up tomorrow (woo-hoo! ), it's time for me to buckle down and get back to some serious work. But before that, I'd like to thank everyone who voted and commented and "Liked" my MeeGenius Author Challenge submission, E is for Apple. The voting closed in December and we took a respectable 58th place out of 400 accepted submissions with 187 votes! Finalists will be announced January 31st. Alas, E is for Apple will not be moving on to the finalist round, but hey, it was totally fun to be a part of the competition. I received such an outpouring of support for this quirky little ABC book, so don't give up hope yet. I'll be submitting E is for Apple to other publishers, so who knows? Anything's possible. Enter the next phase: 12x12 in 2012. 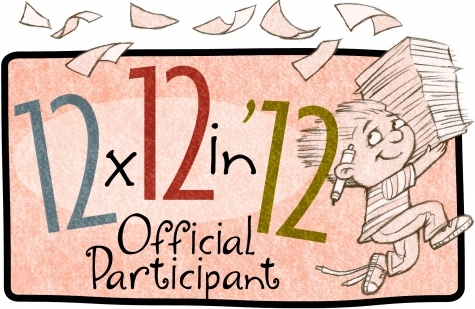 Writer/Blogger Julie Hedlund is hosting a great new writer's challenge that nicely follows the brainstorming frenzy of PiBoIdMo... Write 12 picture book first drafts over the 12 months of 2012. Oh baby, I am so in. I have always tended to need deadlines, assignments, lists and structure, so 12x12in'12 is just what the doctor ordered. In some ways it seems like a lot, and in others, not. One full, rough draft of a picture book in 30 days is totally achievable. Now do that 12 times in a row, without fail. Okay, that takes commitment, but still not impossible. In the past, I wouldn't move on to a new story until I had exhausted and polished the one I was currently working on. But I'm finding that approach of "one-story-at-a-time" to be less practical these days. As my idea list grows and grows, I find myself dabbling and dipping my toes into multiple stories simultaneously. If one calls to me, I work on it. If the next day, that story hits a roadblock, I might set it aside, let it stew a bit, and move on to a different writing style for a while. Then, bam! That story I set aside comes rushing back to me with new solutions. Of course, eventually you gotta stop dippin' toes and just jump in the deep end and get a first draft written. Once a story starts to gain momentum, it takes priority. But most times you don't really know how good (or bad) your awesome idea is until you actually try to write it! So, working on multiple stories at different levels of completion seems to be fun and working for me, for now. And while I do that, 12x12in'12 will keep me in check. No dilly-dallying. Every month, AT LEAST ONE completed, beginning-middle-and-end, rough draft... if not more... we'll see. Anything's possible.